Just checked out this month's Muscle and Fitness, and the feature article is Brady Quinn workout program at the EAS headquarters in Colorado. It talks about the Cleveland Browns QB Brady Quinn's work ethic and commitment to training. No doubt the guy is a beast. He trains hard and from what I read, is doing all the right exercises and drills to keep his body in peak condition and injury free. From kettlebells, to bands, to rollers, to his dynamic warm-up he is training for sport specific movement. His program by the looks of it is functional to his sport and position. He trains his core and is big on keeping up on his flexibility training. These are crucial elements that need to be included in any athletes training program. 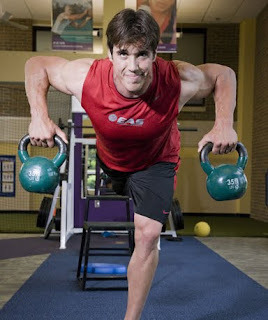 Brady Quinn, who has always looked the part really backs it up with his work in the gym to target football specific movements. Obviously his hard work and commitment in the weight room is paying off. If you are a DB or LB and are looking to improve your backpedal, there is a great drill that I use with my athletes that produces great results. Using a Speed Chute, put the speed chute on so that it is in front of you not at your back. perform resisted speed chute backpedals starting with 10 yards then increasing the distance. Be sure to make sure the hips stay low during the backpedal. Variations of this drill include giving the athlete commands to backpedal slow and fast, backpedal with a turn and sprint, backpedal with hip rotation right adn left, and backpedalling in a snake like fashion. These drills are excellent for DB's and LB's to work their position specific backpedal, drops and hip action. Our Speed Chutes provide the perfect amount of resistance in the backpedal drill. Be sure to get your now to perform this exercise in your training! Speed Chutes work great for improve speed forwards or backwards. We use them often when training for the NFL Combine, lowering the 40 yard dash or preparing for the NFL season!